Katana adopts the name of the traditional sword carried by the historic samurai of Japan— a symbol of honour, precision, and artistry in Japanese culture, and carries that name with great pride. These aspects are represented accurately within the Katana range of amplifiers providing guitarists with smooth, cutting tones which are the result of meticulous design through the pursuit of that perfect rock tone. The Katana 100/212 is a gig ready amplifier that features 2 x 12-inch speakers which have been custom designed by the geniuses behind Waza, as well as a host of effects and tonal capabilities that can be explored at all volumes. The Katana 100/212 is the perfect touring and recording amp for the discerning musician. When the live arena calls for that big sound, there is simply nothing like letting two 12-inch speakers roar. The Katana-100/212 delivers tone in bucket loads as well as exceptional touch response whether recording, rehearsing at lower volumes or playing the festivals of the world. The two custom 12-inch speakers are driven by a specially designed method which was developed for the flagship Waza amp to optimise the speaker and cabinet character. This meticulous design from the genius minds behind Waza technology ensures you have enough power when needed with all the expressiveness and tonal nuances you expect. Of course, having 100 watts of power and 2x12-inch speakers is great when you’re playing the likes of Glastonbury or you’re touring across the country. However, when the time comes for rehearsing or playing smaller, more intimate venues, you want to be able to enjoy all the responsiveness and cranked-amp tonal qualities at a lower volume. With this in mind, the team at BOSS have integrated the Power Control feature, which allows you to enjoy all the beautiful sounds of an amp at maximum overdrive at lower volumes. This makes it a perfect studio, rehearsal and home practice amp. You get the same inspiring tones at all volume levels. The team at BOSS have sharpened the Katana’s sound to perfection. The Katana 100/212 features 5 amp characters which offer an array of different sounds, from lush vintage tones to modern high gain rock sounds. Choose from Clean, Crunch, Lead, Brown and Acoustic to find your perfect sound. Clean offers crystal clear and transparent tones, bringing out the best in your guitar, while Crunch brings you those gritty tones you need for when the music gets heavy. The Lead character ensures you can sculpt the perfect lead tone, whether you like blues tones or fluid shredding styles – simply take advantage of the wide gain range. The Brown has been designed with the DNA of the Waza amp to bring you highly coveted, and high gain tones which have been made famous by the world’s leading rock players. The Acoustic character has been designed to bring out the best in your acoustic electric guitar, ensuring they sound as natural as possible. The Katana 100/212 features an array of built-in effects to get you started, enabling you to play anywhere with just a guitar and an amp, so you’re good to go straight out of the box. However, the team at BOSS know guitarists sometimes need more! By connecting to BOSS Tone Studio via USB, you have access to 55 effects in addition to the built in options. These effects span the usual suspects such as reverb, delay and standard distortion, as well as a whole host of different tone-shapers such pitch shifting, ring mod, slicer and so much more. You can even leave your pedalboard at home as you are able to load 15 effects in the amp and use 3 simultaneously. The optional footswitch and expression pedals (sold separately) are perfect for hands free switching. By accessing the BOSS Tone Central website, you can take advantage of a whole host of free amp and effects setups specifically designed for the Katana amp series. These setups have been designed by pro guitarists to provide an array of ready-to-play sounds for various musical styles. These settings can be loaded into the 4 memories of the Katana 100/212 via the BOSS Tone Studio Editor software where you can create your own sounds, tweak effects and organise your Katana setups for your gigs, rehearsals and studio recording sessions. 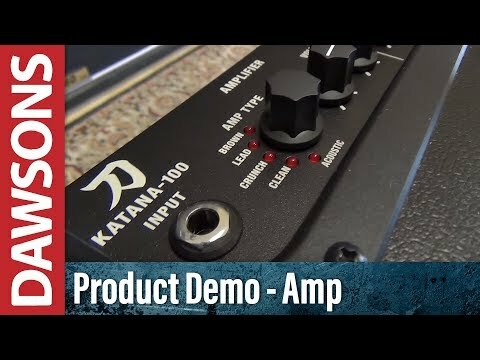 Although the Katana 100/212 features a wide variety of advanced features, the amp remains easy to use and extremely simple to operate. You have a selection of dedicated knobs for multiple gain stages as well as a three band EQ and presence controls. This means you can still dial in your tone by ear, the same way you would with any other amplifier. Memories are quickly stored via a brief hold of a button whilst the Standby setting can be activated for quick, noiseless guitar changes or when you’re taking a break. BOSS are famous for the construction quality of their equipment, especially their stompboxes. The Katana 100-/212 amplifier, along with the rest of the series is no exception. A strong, sturdy enclosure keeps the internal components safe and the 2x 12-inch speakers secure, whilst the corner protectors ensure the amp can handle transport and those long tours in the back of a van. Those who have to transport their amplifiers regularly will appreciate the fact the amp is lighter than most of their 2x12 counterparts. Weighing in at a comfortable 19.8kg, your back and eventually your roadies will thank you for choosing a lighter option! The BOSS Katana-100/212 is a professional grade amplifier with an impressive number of features, providing guitarists of all levels with a huge amount of versatility.